Mystery Lovers' Kitchen: Welcome Gayle Leeson! 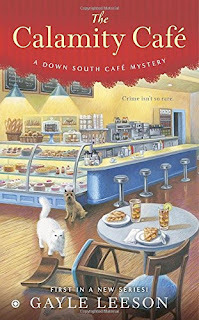 A very warm welcome to Gayle Leeson, author of the brand new Down South Cafe Mystery series! You may know already be a fan of Gayle's. 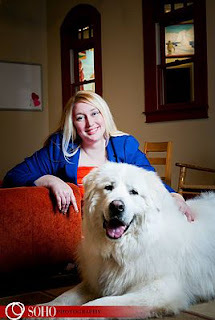 She also writer as Gayle Trent and Amanda Lee. Gayle is giving away a copy of The Calamity Cafe today. To enter the giveaway, please leave a comment with your email address so Gayle can notify you if you win. Good luck! This recipe is contained in my upcoming book, The Calamity Cafe. My grandmother made the best meat loaf I've ever tasted. It's nothing fancy, but it's delicious. The recipe makes a large loaf, so I loved to have a meat loaf sandwich with mustard the next day. Like Amy, the heroine in The Calamity Cafe, I was very partial to my grandmother. She was my champion--the one who watched all the shows I put on when I was growing up, the one who told me I could do anything I put my mind to, the one who taught me show tunes while driving me on country roads with the car windows rolled down. In The Calamity Cafe, Amy Flowers is tired of waiting tables at Lou’s Joint. But she doesn’t just quit—she offers to buy the place from her bully of a boss, so she can finally open the café of her dreams. Amy can't wait to serve the kind of Southern, down-home treats and dishes that her grandmother always loved to the kooky cast of regulars at the restaurant. She knows her comfort food will be the talk of the sweet, small town of Winter Garden, Virginia. 2. Mix all ingredients except tomato juice well. 3. Add tomato juice gradually, making mixture solid enough to handle. 4. Form into a loaf. 5. Bake in a loaf pan for 45 minutes. To read the first chapter of The Calamity Cafe, please visit http://www.downsouthcafechapter.com. I'm giving away a signed copy of THE CALAMITY CAFE to one lucky reader (U.S. entrants will get a signed mass-market paperback, and international entrants will get a Kindle copy). To enter, comment below with your favorite comfort food and your email address so I can notify you if you win. Good luck! The first chapter has me hooked. My favorite confort food is my hubby's homemade spaghetti and meatballs. It's the best homemade sauce I have ever had. Pretty much any homemade food like your meatloaf with potatoes and vegetables will do. Anything that makes me think of meals growing up. My favorite comfort food is ANYTHING my Memaw used to make! My grandma lived with us when I was growing up and she and I were very close. I still cook the way she taught me with the brands she used, and with the love she would add! I would love to be entered to win The Calamity Cafe book. For me, it would be a potato casserole with corn flakes (on top). Thank you for the recipe and giveaway. I always ask my mom to make her meatloaf with mashed potatoes and spinach. My Mom when we were kids used to make meat loaf with boiled eggs and/or Velveeta cheese chunks in the middle so that when it was sliced it looked neat. We loved it with mashed potatoes and veggies. Yum!! I'd like to try this series. My go to comfort food is mac and cheese. Ice cream is a close 2nd though! This sounds like a great series! Thanks for the chance to win. Without a doubt - mashed potatoes! It's a toss up between baked mac and cheese or pork loin with spaetzle and gravy. Then again most food is comfort for me, LOL. Spaghetti with meat sauce is my favorite but, mine not what my kids make for me. There's is always really spicy and I don't like it that way. I like it nice and simple. I am a vegetarian so I make a healthier version of my Moms depression era casserole that soothes my soul. . Grilled Broccoli, cup of milk, cream of mushroom soup ,pound of grilled mushrooms, cup of peas, 2 cups wide noodles cooked, pepper to taste, parsley and on top Moms cure all, a sprinkled crushed half bag of potato chips. Works every time!!! I love a good meatloaf and this one sounds yummy! I know the book will be great. I'm not feeling well today---and some good comfort food like that meat loaf sounds awfully good.